When Blake Pyron was born, his mother said that she, like many mothers of children with Down syndrome, was told there'd be many things he wouldn't be able to do. "When you're handed a child with special needs, society doesn't tell you to expect a lot," Mary Ann Pyron told ABC. "So many moms are told, 'Your child cannot do this.'" On May 7, Blake, now 20 years old, will open his own snow cone shack. 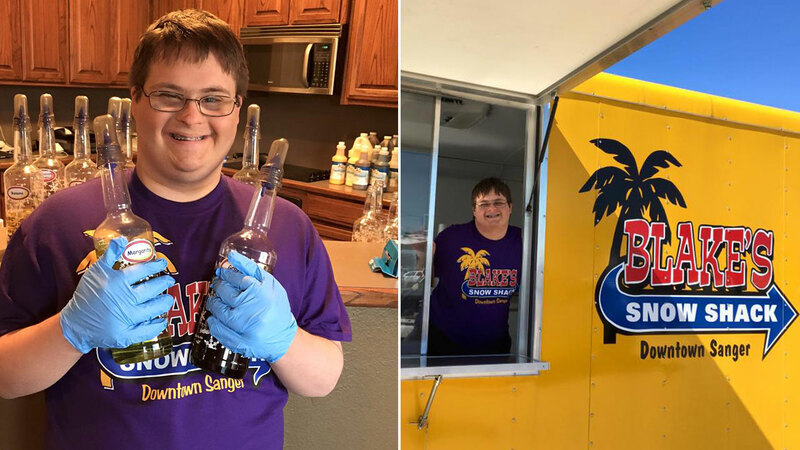 Blake will be the youngest business owner in his town of Sanger, Texas, his mom said, and the only one with Down syndrome. His journey to become a business owner started shortly after he graduated high school. Blake loved his job working at a barbecue restaurant, but it closed one month after his senior year ended. "He deeply missed his customers. He wanted a job," she said. "In our small town, jobs are limited, especially for people with special needs." So the Pyrons began researching ways that Blake could create his own job by starting a business. Blake's interests and their research kept bringing them back to one idea: snow cones. After word got out that Blake was opening a snow cone shack, members of the community rallied behind the budding business, his mom said. Blake's brother helped out by crafting up the shack's creative flavor options like "Shark Attack" and "Hulk," and they hired a 15-year-old family friend, Tanner Maples, to be one of Blake's employees. As for Blake, his main role will be customer service, which his mom called his strength. Blake is where he is today because his family didn't listen to naysayers, his mom said. "We were told Blake wouldn't be able to do things, and we looked past that," she said. "You don't know us. You don't know our child, so don't label him. We haven't, and he turned out great." It's no accident that the grand opening will be shortly before Mother's Day, Blake's mom explained, as it will also celebrate the moms in the community. She hopes her story inspires mothers of other children with special needs to never place limits on what their children can do. "I want to personally challenge moms to believe in their child," she said, "no matter what society tells you."